Diamond alternatives make great options for larger stone wedding and eternity bands and come at a reasonable price point. What metals are available? We can craft these custom moissanite wedding rings for you in white gold, yellow gold, rose gold, and platinum. What styles are available? For now, we are offering the moissanite eternity bands in basket prong set and “U shape” styles. The U shape design features four prongs and an open profile view. Do note that these can also be made with any number of stones you like. You might prefer a 5 stone, a 7 stone, or a 3/4 of the way around ring. The basket styles feature moissanites set in an airline basket leaving a graceful open space on the profile of the ring and eliminating the bulky metal look. What shapes are available? 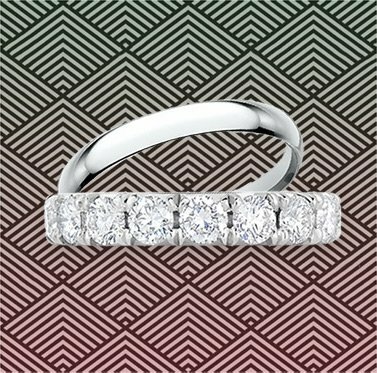 Currently we can create moissanite eternity bands in any shape/cut of stone available you like. The most popular is the round moissanite eternity band, however emerald cuts, cushions, ovals and more are options to consider as well. In particular, fancy cut stones will work well with moissanite bands because of how much easier it is to create a layout of perfectly matching stones for the ring. In the diamond world, an oval cut eternity band is extremely difficult to create because cutting each diamond to precise matched measurements and quality is a large undertaking; this is why they are relatively expensive. On the other hand, moissanites are created in uniform qualities, and because they are lab created they can all be made to the exact same measurements without any variations. What moissanite sizes are they available in? The smallest size moissanite we can use are 4mm each moissanites which are equivalent to around 0.25 carat in diamonds. We currently do not offer them in pave settings because the amount of force and pressure and needed to pave set each stone would cause durability issues in the moissanites. What are the prices? The prices, you can imagine, are a fraction of the cost of natural diamond eternity bands at the same size. A diamond eternity band ring shown with around 4.0 carats of natural diamonds would cost in the range of $8000 +/ - depending on finger size, quality, metal type etc. An equivalent sized moissanite would be in the range of $3000 +/-. This is a huge savings offering you the same bright sparkle and big look. Who are these good for? Since these bands do feature stones that appear larger than what you find in our micropave design rings, these rings look amazing worn on their own. You can try pairing it with an engagement ring however you might like the look of it separately on the other hand as well. Additionally, this makes an ideal standalone ring if you are travelling or working and don't want to wear an engagement ring altogether. Do they look like diamond wedding bands? For the most part it will be difficult to tell the differences apart between a moissanite and diamond wedding band of equal size. While spotting the differences in a larger center-stone ring is easier, determining the differences in these wedding bands is more difficult because each stone is smaller and their variances in sparkle and fire are harder to pick up on.